Most processed food (not just cereal) is just manufactured junk. I try to eat as little processed food as I can, and when I do, I'm reading the label before I buy. As for the cruelty of mass produced meat products? It's a simple fact of life that we can't have it both ways. The sad reality is business now is forever loking to make more and greater profits, automate, reduce staffing and a lot of this is propagted by unions looking for unrealistic salaries. I always get a charge when Large Companies are annoucing a disapointing profit, they're making a profit just not enough profit. The drive to reduce a labour force is basically increasing the unemplyment which means less taxes and ends up with the mess most of the western world is currently in. Hmmm, maybe because Booth eats so much game meat is part of the reason he is in such great physical shape. Perhaps he's hunting so much this offseason is so he can provide the Canucks chefs with enough meat for the whole team! Yet another one of Gillis' outside of the box initiatives to give the Canucks an advantage. Hunting is cool if your into it. xenaphobe wrote: Hunting is cool if your into it. Is it still cool if you are not into it? Doesn't really matter what you think,this is Canada. That people like to be oot and aboot, eh? Fred wrote: a lot of this is propagted by unions looking for unrealistic salaries. what is the average wage of a worker in a slaughterhouse anyway, I remember back in the day it was about 6-7 bucks an hour at fraser valley duck and goose in Yarrow...is double that today too much, because thats not a realistic living wage. Ha Booth better get a thick skin if he thinks he can hunt here in Canada/BC and post about it Globally on twitter/fb and think he will not get any backlash. Booth "Hockey come back so people can stop complaining about Booth. A lot of hockey players & people in general HUNT! Your just being ignorant, have a problem go join a club that is against hunting & do something about it because honestly facebook won't get your opinion heard." This ain't Florida Booth! Canada actually cares for it's wilderness and wildlife. lol DB is starting to feel the heat. (the original picture) is a great trophie! prolly the second hardest to get! and done with the bow, great job! 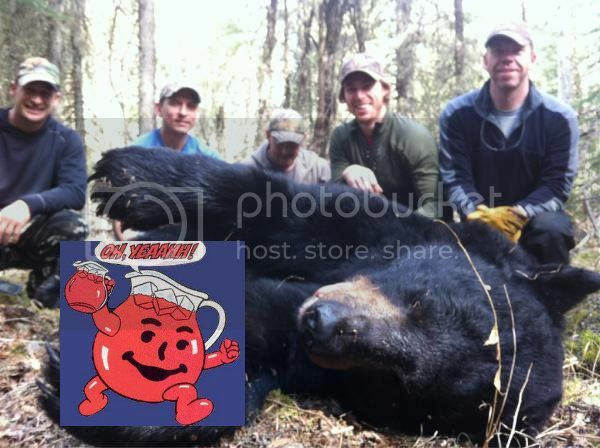 Yeah it seems most of what some of these guys know about bears was gleaned from Yogi and Boo-Boo cartoons.